Over ten years ago, I saw a need among nonprofit and public agency staff for a book that would lead them through the process of developing a social marketing program. So often, health, social and environmental organizations decide they want to apply social marketing to the work that they are doing, but do not have the budget to hire a consultant or marketing firm and still have enough left to carry out the project. I decided to fill that gap in the field, and turned in the first draft of the chapters to the publisher in March 1998, just before my first child was born (it was like giving birth twice in a row!). 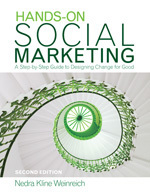 In June of 1999, my book Hands-On Social Marketing: A Step-by-Step Guide was published by Sage Publications. Since then, I’ve been gratified to find out that my book has been used by people all over the world to create social marketing programs, teach college and grad-level courses, and to overhaul how organizations carry out their activities directed toward positive behavior change. It’s always exciting when someone tells me they have used my book and found it helpful. But this blog post is not about promoting the book. Rather, I’m asking for your help. A lot has happened in social marketing — and the world in general — in the ten years since I wrote the book. I’m currently working on the next edition of the book, which will be updating everything that’s outdated and changing chapters and worksheets around based on how my own practice has evolved over the course of a decade. I’ve certainly learned a lot since the book was published, and the field of social marketing has matured as well. So now I’m reaching out to my target audience (you) to do some research to find out what you would like to see in the next edition. For those of you who have read and used the book, whether as a student or practitioner, please let me know your suggestions. What is most helpful about the book? What didn’t work for you in practice, or was confusing? How can I make the book a better resource for you? And even if you haven’t read the book, please let me know what topics you are most interested in learning more about. This is a how-to book, so what parts of the social marketing process do you get stuck in? What topics do you want to know more about? What are the big questions that keep you up at night worrying about your social marketing program? And what would your ideal guidebook look like in terms of format? Any input that you can give me (either in the comments or via email) would be incredibly helpful in making the ultimate product a book that can help you and others to change the world for good. Thank you in advance!